Having played an integral part in the evolution of iiNet’s working environment over the past decade, Valmont was again entrusted, this time to develop their new east coast operations base at 2 Market Street in Sydney. The brief required that the office floor would encourage flexible working whilst maintaining the fun, rewarding element that iiNet workfloors have become synonymous with. The floorplan had to include a central breakout space that would be large enough for whole company meetings and multifunctional in form. Additionally, the boardroom needed to provide a polished, professional space to host board meetings and welcome important stakeholders. iiNet’s history was to be a key design element throughout, promoting not only the company but also staff achievements. 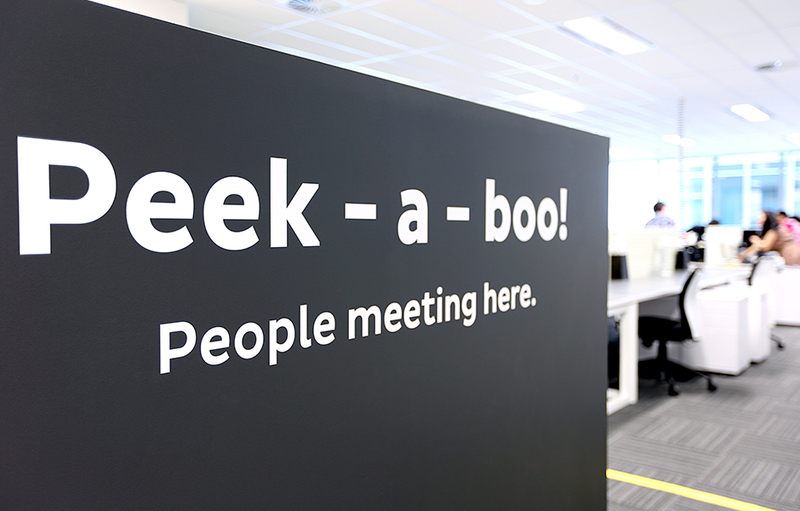 iiNet opted for a virtual reception which made it essential for the foyer to immediately represent the iiNet brand in place of an employee, which was achieved by integrating the iconic ‘ii’ typography into the design of the reception desk legs. This subtle motif is also repeated throughout the fitout in wall panelling and lightshades, while the iiNet brandmark is given a modern twist, appearing in neon for the first time in the brand’s history in the foyer. Moving onto the office floor, the traditional cubicle wall has been broken down, allowing for an open, collaborative space, with all manner of engagements catered for, from sharing and group work to quiet, single-person activity, relationship building with mentors and managers. Elements of playfulness are introduced to more formal meeting rooms through colour and theming. Informal areas like The Patio, The Family Room and The Games Room give staff the feeling of working from home while still benefitting from the resources and interaction provided by office work. The Patio incorporates tropical-patterned wallpaper, a hanging basket chair and soft green furnishings, creating an oasis of calm for informal staff meetings. The Star Wars meeting zone provides an alternate level of acoustics and privacy, and the breakout zone offers a dynamic space moving from city café to home breakfast bar, club-lounge room and diner booths all on the one floor. Key to design success was to make staff feel rewarded. Valmont's response was the creation of The Hall of Fame to celebrate employees’ achievements and The Family Room to commemorate iiNet’s rich history, which includes sketched picture frames exhibiting the names of companies that are now part of the wider iiNet family. Glass signage provides feedback for staff on the number of steps between key points in the office, encouraging staff to move around the office floor and increase their regular physical activity. Writeable panels throughout the office floor and breakout space encourage employee interaction. As Australia’s second largest Internet Service Provider, iinet is the leading challenger in the telecommunications market. Employing more than 2,500 enthusiastic staff across three countries, iinet supports 1.8 million broadband, telephony and Internet Protocol TV (IPTV) services nationwide.